Relax in one of Microflite’s luxurious helicopters and enjoy the spectacular coastal views as you bypass the traffic and fly directly to the event, in comfort and style. Absolutely the best way to arrive at this must-attend event in the social calendar. Shuttle and exclusive flights available. Multiple departure times to and from Point Nepean, Portsea available from Melbourne Heliport, Melbourne (Tullamarine) Airport and Moorabbin Heliport. Relax and await your pilot in Microflite’s welcoming lounge at our Moorabbin Heliport facility. 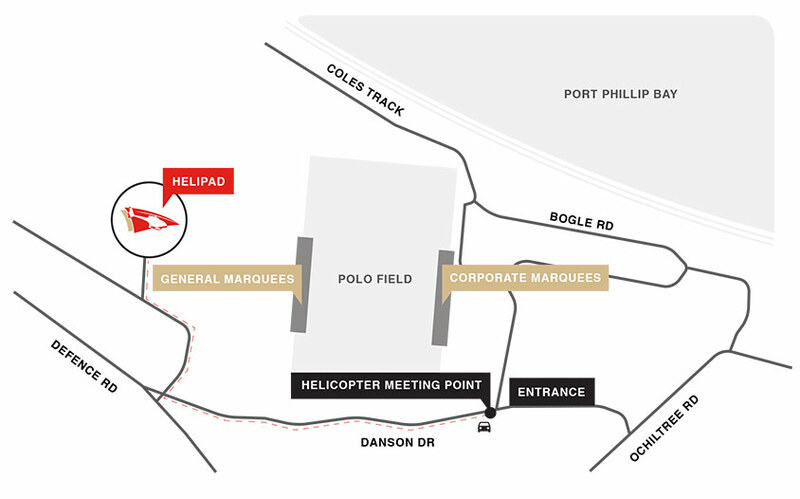 Meet at our Melbourne helipad lounge in the bluestone building near the Spencer Street bridge in Batman Park. Our helipad at Melbourne Airport is conveniently located at the Mercedes Benz facility, a short drive from the terminals. Do I need to arrive at the helipad earlier than my departure time? Yes, you must arrive at the helipad 15 minutes before your scheduled departure time. Microflite has a strict schedule to follow on major event days. If you are late for your flight the helicopter will not wait for you. Can I bring luggage on board my flight? Any bags larger than a handbag must be arranged with Client Services when creating your booking. Luggage that has not been approved by Microflite prior to your flight will not be permitted on board. What will happen if I have booked a return flight but the weather changes and Microflite can’t fly the return leg? Your safety is our top priority, and Microflite will cancel flights when we feel safety margins may be affected. Our Client Services team will keep you updated with weather reports if we believe weather may impact your scheduled flight. If your flight is likely to be cancelled, we will notify you in the morning of the event. You will be given the option to cancel your flight and receive a full refund. If you decide to go ahead with your flight, but the return is later cancelled due to weather you will be refunded the difference between a return and one-way flight. You will need to find your own transport to return from the event. Can I drink alcohol on board the helicopter? No alcohol is permitted on board the helicopter. If you miss your flight it is regarded as a ‘No Show’. As per our cancellation policy, a ‘No show’ is regarded as a cancellation by a client made less than 48 hours from the booking, and no refund will apply. Do I need to purchase a ticket to the event or is this included with the helicopter transfer? You will need to organise your own entry ticket to the event. Microflite provides transport to and from the event, but does not provide entry. Look for a red shirt or jacket. Microflite staff at major events wear red tops for easy identification. 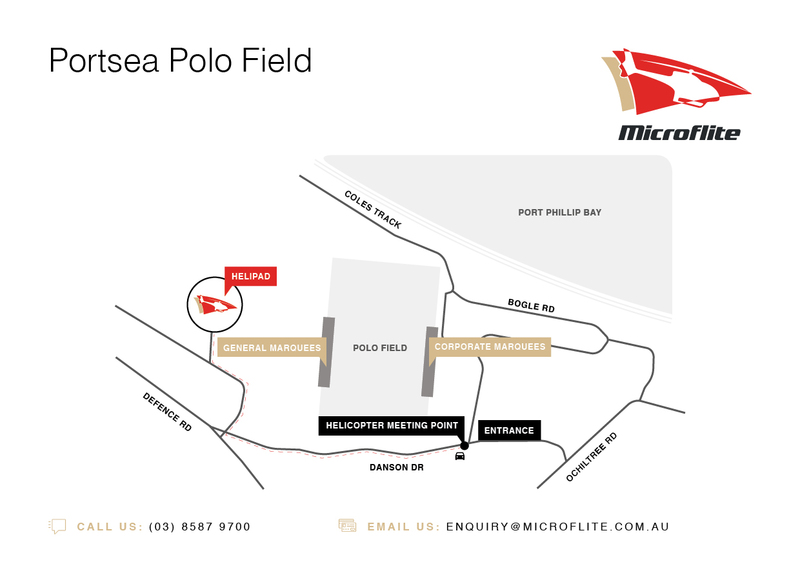 How do I get from the helipad to the entry gate at Portsea Polo? An Alfa Romeo car will transfer you to from the helipad to the entry gate. How long does the car transfer take? It takes approximately 2 minutes for the car transfer from the helipad to the entrance. Are there bathroom facilities at the helipad at Portsea Polo? Limited bathroom facilities are available at the helipad. What time should I arrive at the helicopter meeting point for my return flight? Please arrive at the helicopter meeting point 20 minutes before your flight to ensure you are at the helipad 15 minutes prior to your scheduled departure time. I have booked a one-way flight from Portsea Polo, how do I find the helipad? Helicopter departures available from our Melbourne Heliport, Moorabbin Heliport or Melbourne Airport and be tranported directly to the event. Custom event transfers available. Contact us to find out more. The Melbourne Spring Racing Carnival is the highlight of the racing year in Australia, with the very best of Australian and international thoroughbreds converging on the city for 50 days of world-class horse racing action. The whole event ignites the city and signifies the start of Melbourne’s springtime. Melbourne is arguably one of the hotspots of world motorsport. From road racing to the speedway and the blue ribbon annual Formula One™ Grand Prix opener, Melbourne is a petrolhead’s dream. Get sweeping aerial VIP views of the track and head directly into the action with a Microflite Helicopter. The Melbourne Polo scene is growing every year. With the best Australian and international players on display, a day at the Polo combines glamour with the exhilarating speed and agility of this spectacular sport. Enjoy the fashion, food & wine, all whilst mingling with celebrities. With a variety of polo events hosted in Werribee mansion, Flinders and Portsea, arriving in a Microflite helicopter is the perfect entrance!